The former CEO of VBS Mutual Bank claims he knows nothing about the epic amount of fraud that allegedly sucked R1.5 billion out of the bank he ran. Andile Ramavhunga this week filed a responding affidavit in VBS curator Anoosh Rooplal’s application to sequestrate him and the other directors of VBS, and liquidate its majority shareholder, Vele Investments. He does not confirm or deny that the fraud happened at the bank he ran, but simply says that no one told him about it. He says he was not present at the meetings where the fraud was allegedly orchestrated by Tshifhiwa Matodzi, the chairperson of the bank and Vele Investments. According to his affidavit, a number of VBS bosses met at the Sundowner Bar in Randburg on March 11 – the day after VBS went into curatorship. When an argument ensued between the alleged mastermind, Matodzi, and the former VBS treasurer who carried out much of the fraud, Phophi Mukhodobwane, Ramavhunga claims he immediately headed for the door. He took his colleague and business partner Tsumba Matambele, VBS’s branding and marketing consultant, with him, saying “we were now being exposed to information which we had no knowledge of”, according to Ramavhunga’s version. Mukhodobwane is the main source of evidence about the fraud at VBS. According to Ramavhunga, “on or around” that same day, Mukhodobwane called him. Apart from claiming ignorance and raising several technical objections, Ramavhunga disputes only one allegation made specifically against him in an explosive affidavit filed two weeks ago by Rooplal – that he received a R15 million “bonus” from VBS funded by one of the many fictitious deposits the bank’s bosses allegedly created to steal more than R1.5 billion from real depositors. The R15 million was a legitimate success fee for brokering Vele Investments’ R300 million acquisition of Mvunonala Holdings last year, claims Ramavhunga. This acquisition, like all the big acquisitions Vele made during 2016 and last year, was allegedly funded by defrauding VBS of the needed money. Ramavhunga says he was paid the R15 million after he brokered the deal with his friend Bongani Mhlanga, who owned Mvunonala. Bank statements before the court incidentally show Mhlanga was personally paid R12.5 million by Vele Investments over three months corresponding to the deal – September to November last year. Mhlanga was evidently keen to set up more deals for Vele. Emails included in Ramavhunga’s court papers show Mhlanga advising Ramavhunga to somehow buy the Zimbabwean state-owned Agribank – a similar entity to South Africa’s Land Bank. “Agribank. This is one Zimbabwean bank that I want you guys to acquire. I will be seeing the CEO of the bank on Monday. Probably when you get there I can squeeze a meeting for the three of us,” Mhlanga wrote to Ramavhunga on August 4 in the middle of Vele’s acquisition spree. Ramavhunga claims he was just another person finding deals for Vele in exchange for commissions. City Press reported last week how 27-year-old businessman Kabelo Matsepe received about R12 million in fees from Vele, according to bank statements. While Matsepe and other “agents” had written contracts, Ramavhunga says his deal was entered into “by oral means”.
. Ramavhunga has acted as an “agent” for a company called Mamepe Capital since 2013 – the year he joined VBS. Mamepe Capital and VBS are jointly embroiled in a court drama in Namibia related to the implosion of the Namibian state-owned SME Bank. About R200 million of SME Bank’s funds were invested via Mamepe and deposited into VBS at the end of 2016, but then allegedly disappeared. SME Bank’s liquidators are fighting a series of court cases, after which they can institute a proper investigation of what happened to the money. A source close to the Namibian fiasco said it was “news” that Ramavhunga had ties to Mamepe. Ramavhunga had earlier filed an affidavit in Namibia in relation to the matter without mentioning the potential conflict.
. The “agent” brokering an ill-fated R1 billion deposit at VBS by the Passenger Rail Agency of SA (Prasa) last year was Bhekwayinkosi Gift Manyanga through his company Bhekwam Holdings. Manyanga was paid R1.5 million for getting Prasa to agree to the investment, which was then cancelled. This corresponds with Rooplal’s earlier allegation that “people at Prasa” were paid R1.5 million to secure the deposit that was meant to save VBS from a liquidity crisis in November. Ramavhunga provided the court with a copy of a contract between VBS and Bhekwam. This contract, however, specifically provides for “consultancy services” for R130 000 a month, as well as a “performance incentive”. It does not provide for a success fee, as Ramavhunga claims in his affidavit.
. While Ramavhunga defends his R15 million fee from Vele, he does not explain why he evidently also received a R300 000 salary from Vele, which is visible in his bank statements, and which he himself attached to his court papers. 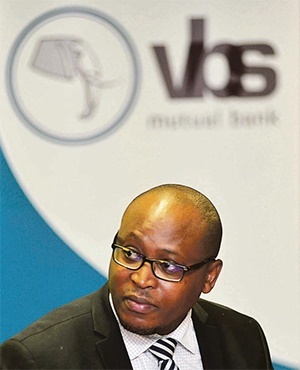 He was the CEO of VBS, not Vele.
. Ramavhunga asserts that VBS’s troubles began in August after Treasury advised municipalities that they could not invest in a mutual bank. At this point, most VBS deposits were from municipalities. However, this contradicts an affidavit earlier this year by the deputy governor of the SA Reserve Bank, Kuben Naidoo, who said the first “liquidity stress event” at VBS occurred on June 20 last year, two months before Treasury’s letter to municipalities. On that day, VBS could not find the R295 million it needed to settle with other banks at the end of the day.